Goplus has released several treadmills in the second part of 2018. The Black Jaguar I, Black Jaguar II, and Black Jaguar III are some of them, but there is also the 4.0 HP model. This machine apparently hasn’t given a name (yet), so for reference, this is the Goplus manufacturer part number SP36159. It’s a heavier machine than the Black Jaguar models and offers a greater speed range. The Goplus SP36159 treadmill features a sturdy steel frame with a heavy-duty construction. The fully assembled unit actually weighs approx. 232 lbs (~105 kg) which is quite impressive for a home-use machine. This being said, the treadmill provides an outstanding stability and overall sturdiness; you can be sure it won’t wobble or move even if you run at top speed. The steel parts of the main frame are coated with a black, corrosion-resistant paint. However, the front console masts feature a silver paint finish. Of course, the machine’s frame incorporates several ABS parts as well, such as the side rail covers, the drive motor cover, and several other small covers. However, the top side rail covers are metallic, with rubber inserts, in order to provide more foot adherence and stability when you stop from running. As pizzazz elements, the treadmill has LED sensors between the two console masts, and the main upright bars, featuring the Goplus logo. When the machine is in use, or when the belt is in motion, the Goplus logo features a red light, while when the machine is in standby, the Goplus logo turns green. This Goplus treadmill is a fairly large fitness machine. With the frame fully set-up, it’s approx. 77″ (195 cm) long, and 35″ (89 cm) wide. This being said, it may not fit too well in a small room or apartment, considering that you have to leave at least a few feet of clearance at the rear, and a bit of space on each side of it. The frame features a folding design, though. The deck can fold up, and with it in a folded position, the machine’s length is reduced to 50″ (127 cm). The folding mechanism has a soft-drop feature. It includes a hydraulic cylinder, so when you unfold the deck, it slowly descends in order to prevent damage. The machine’s deck features a pretty thick structure. It integrates shock absorption elements which are concealed by the side rail covers. These help disperse the cadence shock throughout the surface of the deck which results in considerably less impact on your joints during running. The belt is made of top-quality rubber, featuring a textured surface to maximize adherence. It offers a running surface of 56″L x 20″ (142 x 51 cm). This being said, it’s not an extremely long running surface, so users over 6’3″ (190 cm) may not benefit from a complete stride if running at full speed. But nonetheless, the machine provides a decent running surface. 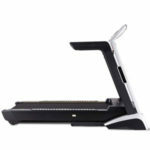 The Goplus SP36159 is equipped with a motorized incline system. In other words, its incline system is automatic and can only be adjusted from the units control panel. It consists of a small motor and a lift both placed at the front of the deck. As you select a certain level of incline, the front of the deck will slowly elevate. 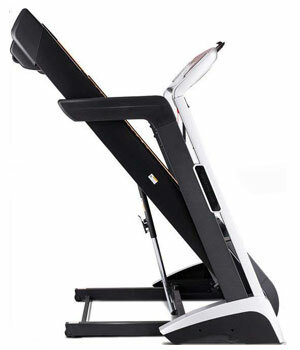 The machine provides an incline range between 0% and 15%. The incline increments are 1%, but the console also provides quick incline controls for the 3%, 6%, 9%, and 12% incline levels. Also, some of the preset programs of the machine auto-adjust the incline throughout their duration. 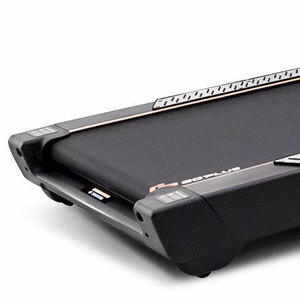 The running surface of this Goplus treadmill is situated at approx. 10″ (26 cm) above floor level. Plus, when the incline is set at maximum, the front side of the deck gains a few extra inches of elevation. This being said, it’s recommended to assemble and use the machine in a room with a ceiling that is at least 15-20 inches (38-51 cm) higher than your own height. As the title suggests, this Goplus treadmill features a 4.0 HP (peak power motor). This being said, its continuous power should be around 2.0 CHP. This means it should perform without any issue even for prolonged workouts at maximum speed, even if the user is close to the maximum specified weight capacity (330 lbs). The machine comes with a power cord, not an adapter; its connection point to the machine is at the front base. It requires being connected to a 110V power circuit. The speed range provided by the machine’s motor is between 0.5 MPH and 12.5 MPH. The speed adjustment increments are 0.1 MPH. Therefore, you can easily find the fitting pace for the desired level of your workout and stride. Just as for the incline, there are four quick speed control buttons on the console, for the 3, 6, 9 and 12 MPH. Last but not least, the level of noise generated by the motor is minimal. Also, due to the internal cushioning, the deck absorbs a great deal from the noise generated by each foot strike. The Goplus 4.0 HP treadmill is equipped with a 7″ diagonal LED display console, divided into five separate windows. The four top windows track the important workout metrics such as time, distance, speed, incline, calories burned, and heart rate. The larger display in the middle shows the grid of the workout program in use. The console is not telemetric. This being said, it cannot communicate with ANT or Polar HR chest straps for the reading of your heart rate. Therefore, in order to benefit from a heart rate reading, you have to use the grip sensors integrated into the front, transversal bar of the machine. The console has 18 preset programs which cover various workouts, such as Peaks, Intervals, Fat Burn, or Performance. There are touch buttons for the quick selection of some of the preset programs on the bottom section of the console. The console also has Start/Stop functions which are great to use if you alternate treadmill workouts with other exercises. This way, you can pause and resume each session without losing your progress to the end of the workout. The top, middle section of the console integrates a foldable tablet/phone holder. The tablet holder is approx. 10″ (25 cm) wide, and can accommodate any type of tablet. The deck of the treadmill comes fully assembled, with both its motors, the roller, the belt etc. Therefore, you only need to add the upright masts and the console. This shouldn’t take more than 30-40 minutes. The manual provides all the necessary assembly instructions, and all the tools needed for the task are included. For maintenance, the belt requires periodic lubrication. The manual also provides instructions for this. Also, it’s recommended to keep the running belt clean, to prevent any objects or textile fibers to be caught into the internal rollers or the motor. And finally, you should periodically inspect the integrity of the unit, in order to re-tighten any loose bolts or replace any broken parts if it’s the case. 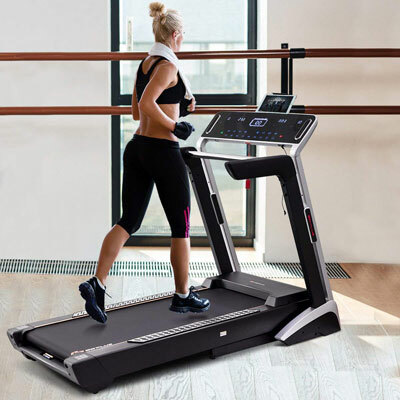 The Goplus SP36159 is a mid-range treadmill designed for home use, featuring a 4.0 HP motor and an automatic incline system. It has quite a sturdy construction and a folding design. 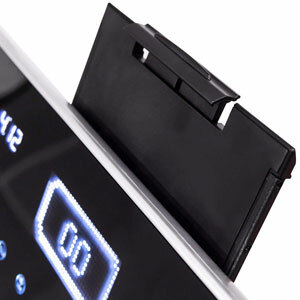 Its console, features a LED display with 18 preset programs. It’s a treadmill that supports running workouts, offering speeds up to 12.5 MPH. It’s an excellent machine for users of all levels, perfect for light to intense cardio training, weight loss, endurance development, and intervals.